As expected, Apple announced the iPad 2 at today’s press conference. Many of the rumored features have been incorporated into this new device and it brings excitement to the tablet world. Steve Jobs took the stage at 1PM EST and showed off the thinner and lighter iPad 2 design. All in all, the iPad 2 is 33% thinner than the original and has an updated A5 dual-core microprocessor that is twice as fast as the original iPad. Additionally, the iPad two have a front and rear facing camera that will do Facetime. The iPad 2 will launch with iOS 4.3 that will have some improved features. First of all, it will improve the way AirPlay is incorporated, allowing music and video streaming from iOS apps. iOS 4.3 will also allow users to be able use the iPad side switch to either mute or lock the screen orientation. This update will be available March 11 for older iPads and iPhones as a free update. 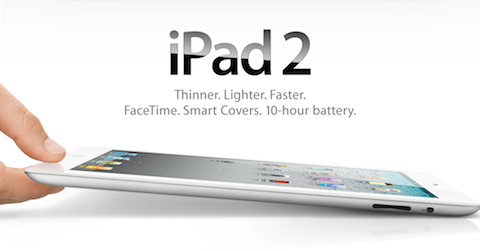 The iPad 2 will be available March 11 and will have the same pricing as the original iPad. It will be available in both white and black. There will be 3G models compatible with either AT&T or Verizon.